Solo piano gigs? Contact floyd@floyddomino for further info. The Museum of Magnetic Sound Recording (MOMSR) did a great job with my interview for their archives. 7:30 PM - 12 Mid. 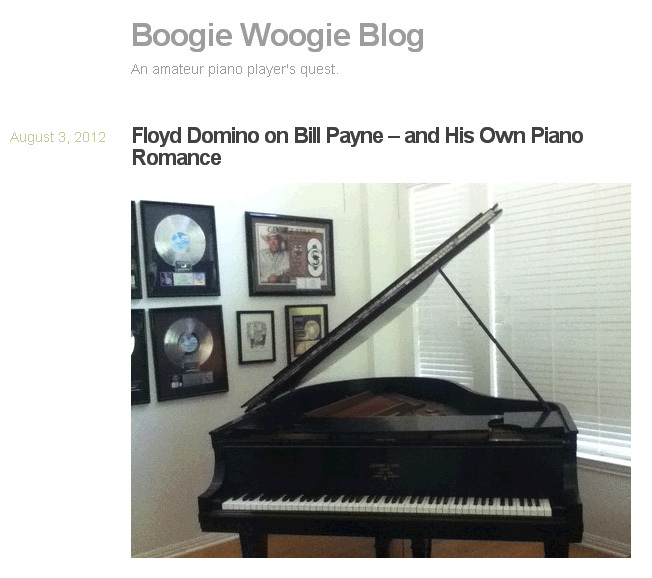 For Solo piano gigs, contact floyd@floyddomino for further info. I met Bill the night before my latest birthday. What a present for Birthday Eve. Pulitzer Prize-winning author Lawrence Wright, who plays keyboards for WhoDo, introduced me to him. We went on the bus and hung out before the Little Feat show at La Zona Rosa in Austin. Bill and I have a mutual friend. His name is Edd Kolakowski. He lives in Spain, but used to work in the Steinway concert department until he went on the road with Linda Ronstadt, James Taylor, and all the other artists that manager Peter Asher could persuade him to get on the bus with. Edd is easygoing, upbeat, and a magical piano technician. In Bill's post, he writes of the magic of Richard Manuel's piano. It's an old Steinway that has a soulful tone, action and response that is like 'buttah', and “plays itself.” Those two words will make a piano player's ears go to full alert, like my dachshund's do when she hears a car pull up in the driveway. 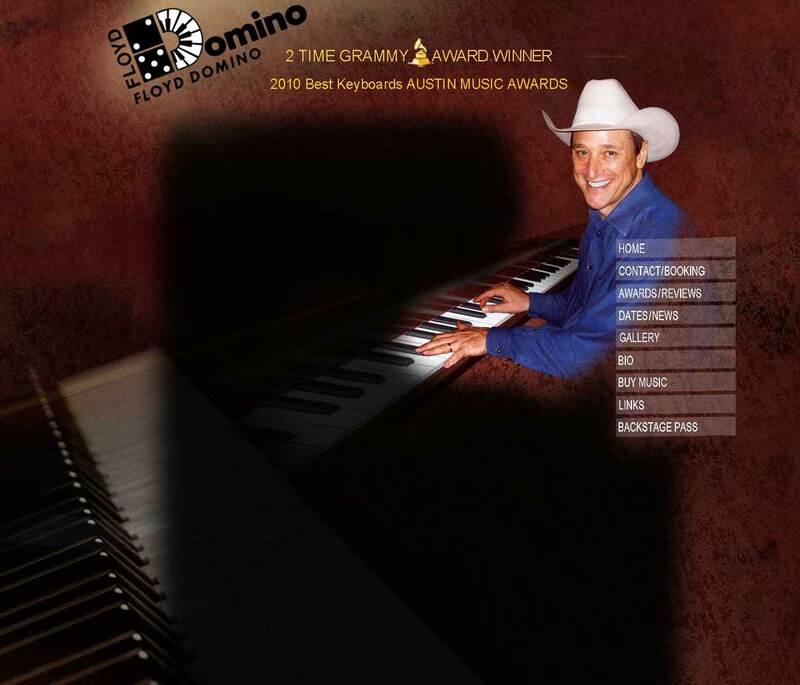 Man, I've got a piano just like that. It's a 1911 Steinway O. First, the touch. You know how iphone/ipad/ipod users LOVE their phone/pad/pod? Well, it's tactile, it's response. Replace aural with visual, add in a lifelong devotion to the instrument, all your feelings, how you make a living, bake for decades, and it is pretty wonderful. CBS had bought and sold Steinway. At one time CBS owned the New York Yankees, Fender, and Steinway. Many old Fender guitars and Steinway pianos are advertised as “pre-CBS.” That means, before CBS messed them up. Since CBS had sold Steinway, I was assured that we were post-CBS. Little did I know that Teflon had been replaced with Teflon II. So, Hollywood is not the only place for lame sequels. I had the action replaced, and invited fellow pianist Barry Walsh over to play it. “It's really heavy, isn't it?” I knew it. It was. It sounded different, too. “The tuner says it'll break in.” The tuner couldn't understand it either. From light and responsive to cement. I will spare you the details, but 4 technicians, 3 rebuilds and 27 years later, one more try. Turns out that every 9 years my musicological clock sounded an alarm, and I tried to reclaim the old magic of the 1911 Steinway O. So, doing some birthday assessing, I thought of how, in 2003, Karla Pfennig had brought the piano to a pretty good place. Nice sound and action. Was my memory of the old magic just my own idealizing? Was it my youth that I missed? The early days of owning a Steinway? The days of discovering a new lick, of barnstorming with Asleep at the Wheel? Maybe the piano was like this in the '70s. I casually mentioned to Bill Cory, my tuner, that when I met Steinway O, #147337, it was my dream instrument. I still loved it. Was there a chance we could get it back, or get me back to that place I inhabited 27 years ago? “Sure, we can do that.” Just like that? Really? In the last few years things have changed. Go for it. One more time. Bill took the action for ten days. Computers are used now to custom design the parts. No, one size fits all. The knuckles on the hammer shanks are back to 1911 specs, 1.5 millimeters from where they have been since 1985. 4.5 lbs of lead came out of the keys, lurking beneath the ebony and ivory. Added as a necessary evil to give force to move the hammers, the lead created an inertia of its own. He installed Abel hammers prepared by Wally Brooks.